It takes a lot of persuasion for my family to branch out and try a new restaurant, especially in the Golden Isles. We have our favorites, and you know how it is when you’re hungry–you want to go somewhere that’s guaranteed to be good, somewhere you know. 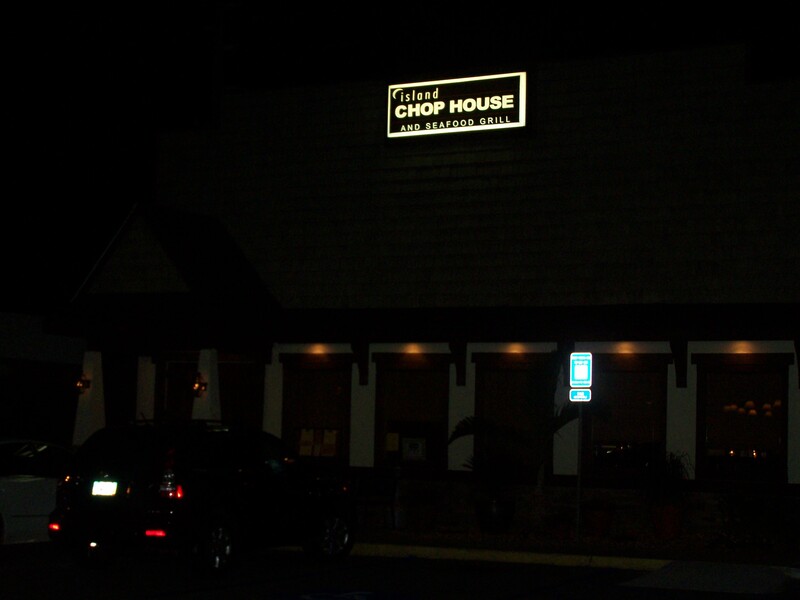 On the Saturday night of Memorial Day weekend, we decided to take a chance on Island Chop House and Seafood Grill, a new St. Simons Island dining establishment that just opened this spring. The food was exceptional, the decor tasteful and I appreciated the fresh take on their inventive side dishes. Call me a snob, but I typically prefer to dine in stand-alone restaurants. Located on Frederica road smack dab next to the Cleaners, there it was. Though I hadn’t expected the restaurant to be in a strip mall, it stood out among the other stores with an inviting exterior. Mom and dad waited in the car while I went in to scope out the scene. I came back with a thumbs-up, having been impressed with the clean, sophisticated decor, friendly host and desirable menu. Upon greeting us, the hostess informed us that there’d be a 30 minute wait. It was 7:15 p.m. and we were hungry, so we weren’t thrilled about the news. Then 10 minutes later, she led us to our table. There we sat and waited until a cheery fellow appeared from the kitchen with three tall glasses of cold water garnished with lemon wedges–a welcomed sight after a long day in the summer heat. Our waiter was as nice as could be and immediately apologized explaining that he was waiting on clean glasses, as the restaurant had been so busy that night. There was a party of 20 at the table to our left and I could see he was right. He told us about the specials for the evening, asked if we had any questions and took our drink and appetizer order. We began with a classic southern menu item: Fried Green Tomatoes. They were lightly fried Georgia green tomatoes layered with goat cheese combined with balsamic-tossed arugula. The presentation was reminiscent of an ice cream sundae. 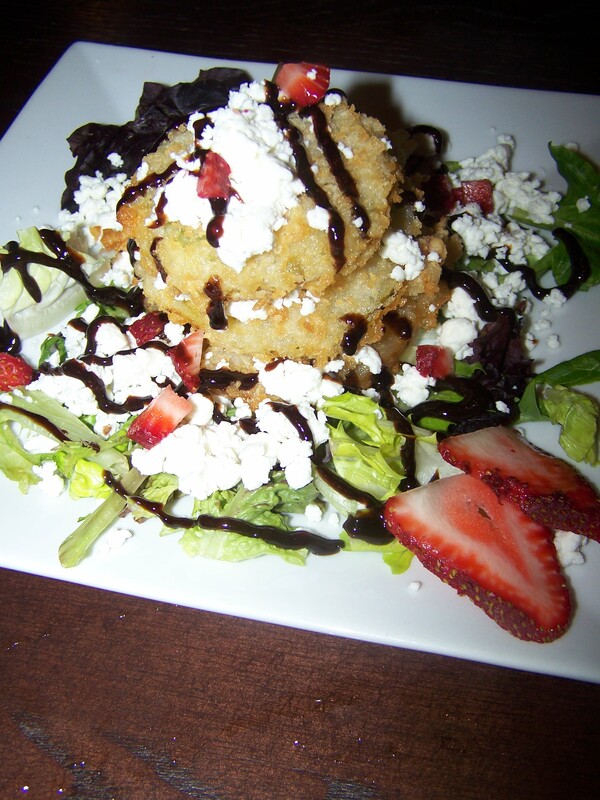 Stacked high, garnished with strawberries and drizzled with what reminded me of chocolate syrup, the tomatoes were crispy and the balsamic dressing provided a sweet tartness with the creamy goat cheese. 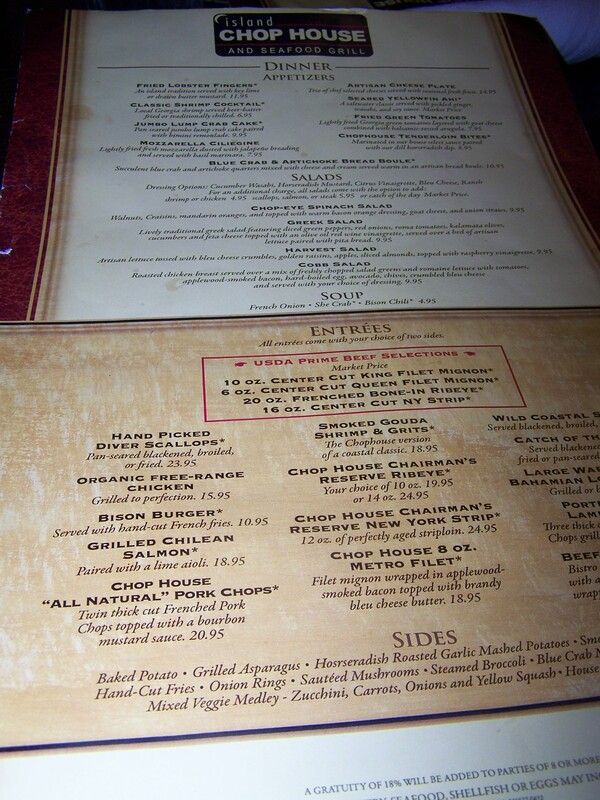 As I looked the menu over, I narrowed my decision down between the Smoked Gouda Shrimp & Grits and the Wild Coastal Shrimp. 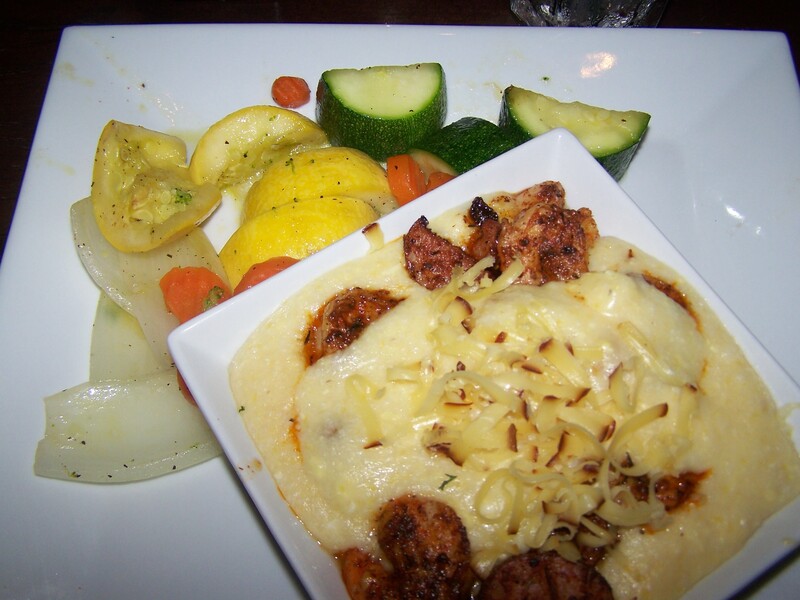 I chose the shrimp & grits for $18.95 with the mixed veggie medley: zucchini, carrots, onions and yellow squash. The dinner entrees come with 2 sides, so I also got a caesar salad. The grits were cheesy and hot, seasoned just right. The sausage was spicy and plump and the shrimp had a Cajun kick. Island Chop House and Seafood Grill offers the usual sides in addition to some pretty cool interpretations of basic carbs and vegetables with the volume turned up. Examples? 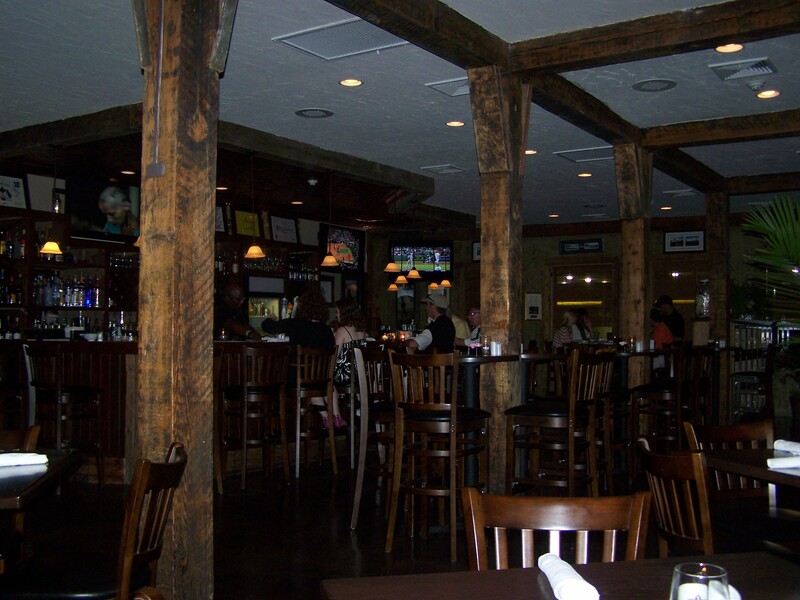 Grilled Asparagus, Horseradish Roasted Garlic Mashed Potatoes, Sautéed Mushrooms or Blue Crab Mac-N-Cheese. Mom got the Blue Crab Mac-N-Cheese and man alive, it was Some Kinda Good y’all. It’s fried and spicy! Maybe to maximize space, the restaurant seating is mostly tables. 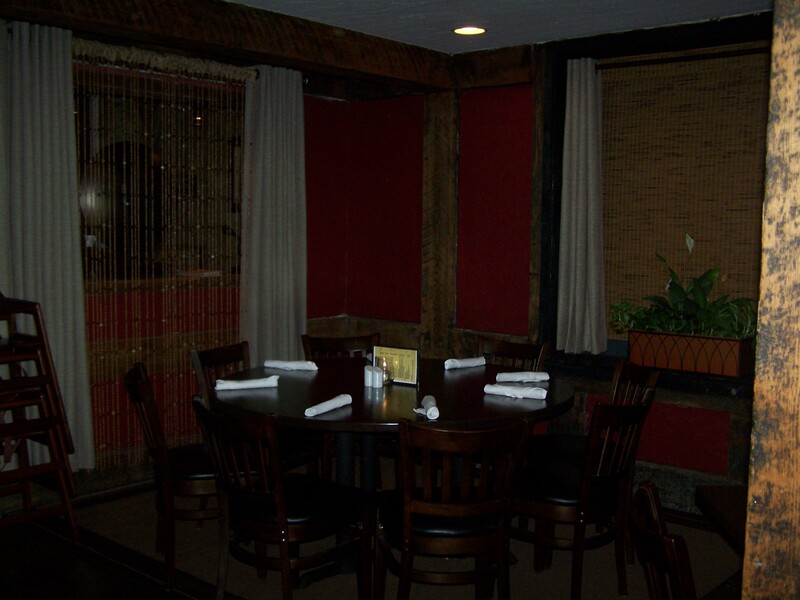 There is one booth in the rear of the restaurant reserved for larger parties. 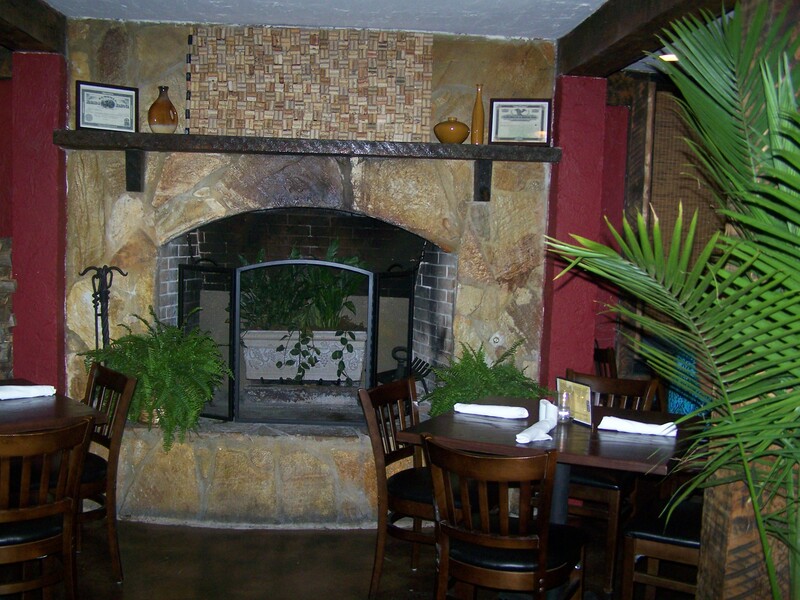 The restaurant is open 7 days a week from 11 a.m. – Until, with Happy Hour from 3 – 6 p.m. daily. I predict it’ll soon be a local favorite and yet another place my family visits to experience fine food on the beautiful St. Simons Island. Have you been yet? What’d you think? I must say the red snapper I ordered was delicious. We did enjoy.